Other Products by Mars. Search other Protein Bars products. * All of the Snickers flavour! Snickers Protein Bar is the perfect balance of protein and flavour! What more could you want than to be able to have your cake and eat it too. 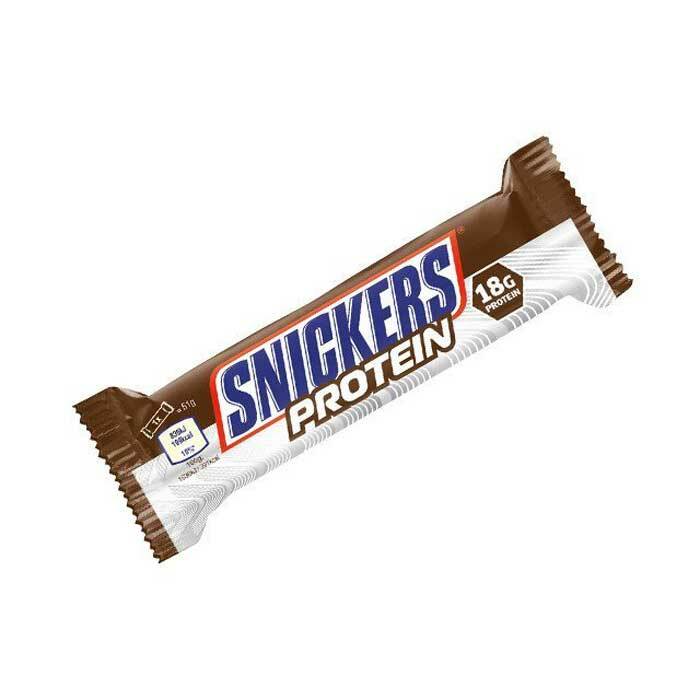 And to take this metaphor literally, we actually have something better than cake here—a Snickers Protein Bar! These are tasty little treats that can be used as a snack or can also be consumed after exercise, when your muscles are ready for a glycemic load and an amino acid hit. After all, carbohydrates and proteins make the perfect post-workout recovery formula. And the Snickers Protein Bar delivers jut over 18 grams of carbohydrates and 18 grams of protein from a mixture of sources, including hydrolysed collagen, casein and whey protein. This means, due to the mixture of protein sources and the inclusion of casein, that your blood amino acids will be sustained over a longer period of time, than would a fast release protein, such as whey protein isolate. Not bad for a Snickers Bar, aye? There are the perfect treats for the cinema or a day out and about when you want to be sure to have a quality protein source that will also maintain your blood sugar levels. For the ultimate protein indulgence, why not give a Snickers Protein Bar a go? Ingredients: Protein Blend (33%) (Hydrolysed Collagen, Milk Protein Isolate, Milk Protein, Whey Protein Concentrate Milk, Emulsifier (Soya Lecithin)), Milk Chocolate (15%), (Sugar, Cocoa Butter, Skimmed Milk Powder, Cocoa Mass, Lactose and Protein from whey, Palm Fat, Whey Powder, Milk Fat, Emulsifier (Soya Lecithin), Natural Vanilla Extract), Caramel (14%) (Sweetened Condensed Skimmed Milk, Glucose Syrup, Invert Sugar Syrup, Palm Oil, Butter, Sugar, Emulsifier (E471), Stabiliser (Pectin), Salt, Natural Flavouring), Humectant (Maltitol), Peanuts (10%), Humectant (Glycerine), Peanut Flour, Fructo-oligosaccharide, Natural Flavouring (Peanut), Salt, Colour (Plain Caramel), Antioxidant (Natural Mixed Tocopherols). Allergens: Contains Milk, Soy and Peanuts.